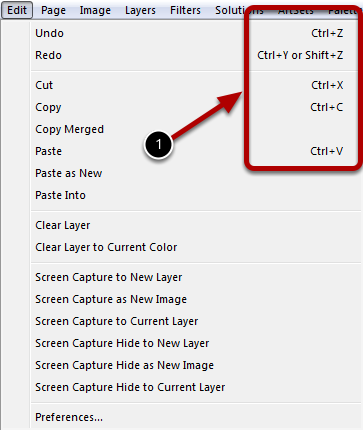 Shortcut keys allow for quicker access to a large number of actions that are available in TwistedBrush Pro Studio. The Reference Manual has a full list of all Shortcut keys. 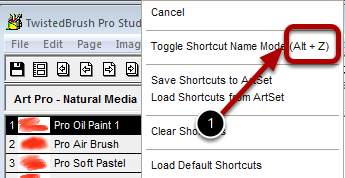 This topic helps you identify shortcut keys that are visible within TwistedBrush Pro Studio menus or popups. Actions that appear in menus that have shortcut keys will show the shortcut key or key combination on the right hand column. The menu does not need to be shown to use these shortcut keys. Actions that appear in popup menus that have shortcut keys will show the shortcut key or key combination on the right side. The popup menu does not need to be shown to use these shortcut keys. Actions that appear in popup tips that have shortcut keys will show the shortcut key or key combination on the right side. The popup tip does not need to be shown to use these shortcut keys.